The Spring Meeting of the Michigan Branch of the American Society for Microbiology will be held on Saturday April 10, 1999 in the McKenny Union of Eastern Michigan University in Ypsilanti, Michigan. 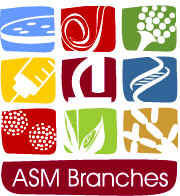 Five research lectures are planned including an ASM Foundation Lecture by Leona Ayers. The basic theme of the meeting is "Trends in Infectious Diseases" and will provide current information for educators, researchers, and clinicians. In addition, student research posters are invited. The meeting is being organized by James VandenBosch. In addition to the presentations, the annual Michigan Branch business meeting will be held during the luncheon. Please note that the presentation by the Foundation for Microbiology Lecturer, Leona Ayers, will be held at the Halle Library Auditorium. The Halle Library is a short walk from the McKenny Union. The lecture is in the library so that it can be teleconferenced with the Upper Peninsula Twig which is having their first meeting at the same time but at Michigan Technological University in Houghton. Medical Director, Ohio Department of Health Laboratories Infectious Disease Diagnosis: Are We Ready for the Third Millenium? Students are invited to present posters. These will be added as the titles are received. Using a functional cloning strategy with an Escherichia coli genomic plasmid library, we have identified a new family of sugar efflux proteins with three highly homologous members in the E. coli genome. In addition, two open reading frames, one present in Yersinia pestis and the other in Deinococcus radiodurans, appear to encode closely related proteins. An in vitro transport assay using inside-out membrane vesicles prepared from overproducing strains demonstrated that members of this new family can efflux [14C]-lactose and [14C]-glucose. Substrate specificity was further explored using both the inhibition of the in vitro [14C]-lactose transport assay and a cell based assay. The results indicate that one member of this family (SetA) prefers glycosides with alkyl or aryl substituents as both isopropyl-ß-D-thiogalactoside (IPTG) and o-nitrophenyl-ß-D-thiogalactoside are substrates for efflux. As sugar efflux phenomena have been reported previously in several bacterial species including E. coli, the identification of a new family of sugar efflux proteins may help reveal the physiological role of sugar efflux in metabolism. It is proposed that the E. coli members of this family, whose functions were previously unknown, be given the gene family designation set for sugar efflux transporter. DNA Sequence Comparison of Chromosome- and Plasmid- encoded mupA in Staphylococcus aureus. M. Raynor*, J. E. Patterson, D. R. Reagen,C. Kauffman, and T. M. Morton. The mupirocin resistance gene, mupA, is associated with mupirocin resistance in Staphylococcus aureus. High-level mupirocin resistance is due to expression of a plasmid-encoded mupA. Since only high-level resistant S. aureus strains have been associated with clinical and microbiological failure, low-level resistant strains have not been considered clinically important. Recent reports have identified, by Southern blot analysis, a chromosome-encoded mupA in some low-level resistant strains of S. aureus. In order to determine if the chromosome-encoded mupA in low-level resitant strains was identical to the plasmid-encoded mupA in high-level resistant strains, a 1.65 kb internal fragment was amplified by the polymerase chain reaction and DNA sequence analysis completed. Chromosomal DNA from four different low-level mupirocin resistant S. aureus clinical isolates, and plasmid DNA from three high-level mupirocin resistant isolates was amplified, sequenced and compared to the published mupA sequence. The S. aureus strains were from three different geographic locations. The amplified DNA of all strains was virtually identical to the published mupA sequence (>98% identity). Therefore, the chromosome-encoded mupA in the low-level mupirocin resistant S. aureus strains studied is identical to the plasmid encoded mupA in high-level resistant strains, and may represent a mechanism for the dissemination of high-level mupirocin resistant in S. aureus. Immuno-chemical characterization of 5-aminolevulinic acid synthase isoenzymes (ALAS-A and ALAS-T) of Rhodobacter sphaeroides 2.4.1. Antisera were raised against the two ALA (5-aminolevulinic acid) synthase isozymes, ALAS-A and ALAS-T, of the photosynthetic bacterium, Rhodobacter sphaeroides. The reactivity of each sera towards its cognate protein was confirmed by parallel immunoblot analysis of Escherichia coli strains expressing fusion polypeptides comprised of portions of ALA synthase and glutathione-S-transferase (GST), using the ALAS antisera and anti-GST antibodies. Further analyses demonstrated that each ALAS antiserum not only binds to both ALAS isozymes (albeit with higher affinity towards its cognate enzyme), but also binds to mouse ALAS. Immunoblot analysis of ALAS-A and ALAS-T overproducing strains of E. coli revealed that the majority of each protein is produced in an insoluble form, suggesting one explanation for the low yield of active enzyme in the case of ALAS-A, and the inability to recover any active enzyme in the case of ALAS-T. The antisera has already proven useful in studying ALAS levels in R. sphaeroides, providing evidence that ALAS-T may be regulated post-transcriptionally, a novel and important contribution to our long term goal of understanding the regulation of expression of the two ALA synthase genes in this organism. Registration for the meeting can be done two ways. Registration can be done electronically by completing the Meeting Registration Form. Registration can also be done by completing the form in THE SCOPE which will be mailed the first week of March. The form in THE SCOPE should be returned to the meeting organizer, Jim VandenBosch, at the address listed below. All registration requests received by March 27, 1999 will receive the Luncheon included in the registration fee. Requests received after March 27 are not guaranteed a meal. Corporate sponsors should contact Michael Huband the Exhibitor and Meeting Program Contact. Please note that membership fees are $3/year for Students and $10/year for full Members. From Detroit or Jackson: Take I94 to Ypsilanti exit #183. Go north on Huron Street. Staying in the middle lane, continue approximately 1 mile through three traffic lights. Move into the left lane and it will turn left onto Cross Street just before a stop sign. Continue on Cross Street staying in the right lane through several more traffic lights. Immediately after the water tower (you can't miss it) turn right into the parking lot. The meeting is in the McKenny Union, the three story brick building adjoining the parking lot. From Toledo, Flint & Lansing: Either take US23 to I94 east and follow the instructions from Detroit and Jackson or take the Washtenaw Ave. (37A) exit off of US23. If you take the Washtenaw Ave. exit (37A), continue east on Washtenaw approximately 3 miles until you come to the water tower (you can't miss it). Make two left turns (essentially making a U-turn around the water tower) and turn right into the parking lot. The meeting is in the McKenny Union, the three story brick building adjoining the parking lot.